You have probably heard about the practice of spaying dogs. Someone might have even asked you if your dog has been spayed. What is a spay and how does it affect dogs? Learn why people have their dogs spayed and decide whether or not you wish to spay your dog. The word "spay" is a common term for ovariohysterectomy. This is a surgical procedure that involves the removal of a female dog's reproductive organs (the ovaries and uterus). A spay must be performed under general anesthesia by a veterinarian. The procedure will permanently stop the dog from having heat cycles and being able to reproduce. Why Do Dogs Get Spayed? Dogs are typically spayed in order to eliminate the possibility of reproduction and end estrus cycles (heat). Spays are often performed on puppies around the age of six months or earlier before the reproductive system is active. Spaying a dog as a puppy will eliminate the possibility of diseases like pyometra (abscessed uterus) and cancer of the ovaries or uterus. It is also believed to reduce the risk of mammary cancer in dogs. Some owners prefer to wait until their dogs are older before they choose to have a spay performed. There are some theories that certain dog breeds can benefit from later spaying. In some cases, an adult dog must be spayed in order to treat a serious medical condition like pyometra. What Are the Risks of a Spay? Complications are very uncommon during a routine spay. However, the procedure is not without risks. As with any surgical procedure, potential complications include anesthesia reaction, excessive bleeding, bruising, and infection. Some dogs will develop hormone-related urinary incontinence, but this is relatively uncommon. It's important for a veterinarian to thoroughly examine the dog and perform lab work prior to surgery. These procedures may reveal health issues that increase the dog's risk of complications during and after surgery. In cases where an underlying health problem is found, the veterinarian may recommend further diagnostics, like additional lab work, radiographs, ultrasound, and additional lab tests prior to anesthesia. The vet may adjust the anesthesia protocol for the dog's safety. Or, the vet may decide that anesthesia is not safe for the dog. Overall, the prognosis for recovery is excellent in healthy dogs. What Happens During a Spay? Before surgery begins, the dog is put under general anesthesia. Pain medication is often started in advance. Most vets use an injectable drug to induce anesthesia, often through an intravenous catheter. Next, a breathing tube is placed in the dog's trachea to maintain an open airway and deliver gas (inhalant) anesthesia. The gas is used to maintain an optimum level of anesthesia. Once the dog is under anesthesia, technicians typically place monitors to track vital signs and take measures to keep the dog warm (body temperature drops during anesthesia). Intravenous fluids may be administered as well to maintain blood pressure, prevent dehydration, and offset blood loss during surgery. Vital signs are monitored constantly to make sure the dog is safe during the procedure. Next, the anesthetized dog is placed on her back on the surgery table in the operating room. A technician shaves the hair on her abdomen, then scrubs the skin with a special surgical cleanser that removes dirt and germs. Staff members in the operating room wear caps to cover their hair and masks to cover their mouths and noses. Meanwhile, the veterinarian dons a surgical cap and mask, scrubs her hands and arms with surgical cleanser, then puts on a sterile surgery gown and sterile gloves. Before making the first cut, the veterinarian covers the dog with sterile drapes to keep germs and debris from getting into the surgery site. Then, a scalpel is used to make a small incision through the layers of skin and body wall over the location of the uterus and ovaries. Using special surgical instruments, the vet navigates through fat and other tissue and isolates the uterus and ovaries. The blood supply to the uterus and ovaries is skillfully tied off with suture before the vet carefully cuts them away. The abdomen is then closed with many layers of internal sutures. Some vets use special skin glue to close the outer layer of skin while others use visible external sutures (this is a matter of the vet's preference and the dog's specific needs). After the surgery is complete, a technician will gradually reduce the anesthesia levels, clean the abdomen gently, then move the dog to recovery. In most cases, the tech will trim the dog's nails while she is still under anesthesia. Additional pain medication may be given depending on the dog's needs. The goal is for the dog to wake up in a soft, warm bed with as little pain as possible. In general, the full process around the spay will last about 1-2 hours (from the time anesthesia starts until the dog is awake). The spay surgery itself typically takes about 30 minutes. Most dogs recover very quickly from spay surgery. However, it is important to keep her rested and confined for a week or two after the surgery to allow her to heal properly. Running and jumping too soon can irritate the tissue in the abdomen, causing inflammation and pain. It can also make internal sutures tear, possible causing the incision to open up. Too much activity can slow the healing process and lead to complications. The dog must also be kept from licking her incision. As the incision heals, discomfort or itching may lead the dog to lick the area. This introduces bacteria and causes irritation, which can lead to an infection. 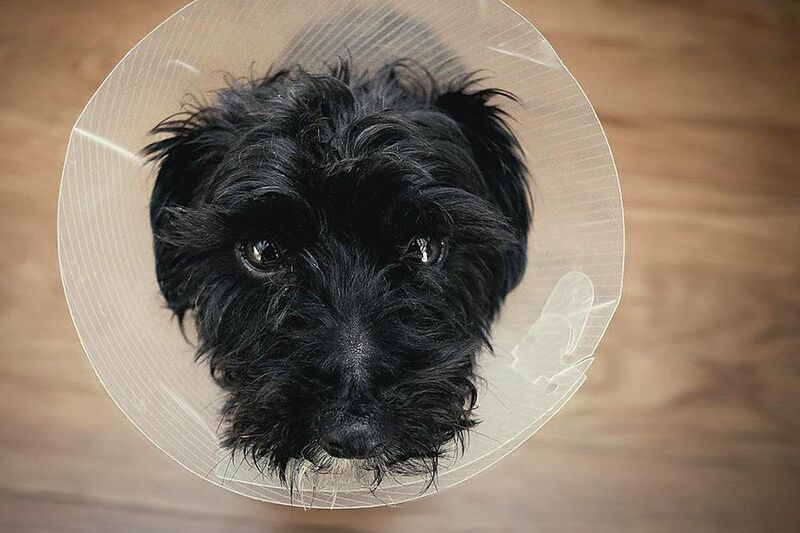 The vet may send the dog home with an Elizabethan collar, known informally as an "e-collar" or jokingly as a "cone of shame." This collar resembles a lampshade and blocks the dog from licking the incision. Most dogs dislike the collar, but it's better than having to go back to surgery! My dog had no complications during her spay. Most female puppies are spayed by six months of age. Will you have the vet spay your dog, or will you keep her intact?